Mr. Mark Goh, the Head of Marina Bay's Development Agency in the Urban Redevelopment Authority (URA) of Singapore, gave an overview of efforts in rejuvenating Singapore's urban waterfront areas including Singapore River, Tanjong Rhu and Marina Bay. 3) Forging a public/private sector partnership. 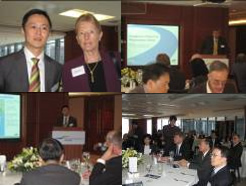 Mr. Goh's excellent presentation attracted nearly 40 participants including high level government officials, business leaders and professional in different disciplines.